2106 SW Marine Dr., Vancouver. There are a lot of impressive numbers associated with 2106 South West Marine Dr.: 10,595 square feet of interior space, three-hole private golf course, and nearly $30-million price tag. But the most impressive of all for owner Peter Bull was its lot size, sitting at four and a quarter acres – perhaps made even more notable by the fact that the property is less than 10 kilometres from Vancouver's downtown core. "I thought, wow, four and a quarter acres in Vancouver – this is unheard of," Mr. Bull says. "I actually didn't believe there was a lot this big." The living room’s wallpaper was removed and the walls painted white. The lot size is actually a relic of the past, according to Mr. Bull. The home was built in 1929 for W.G. Murrin, the same year he was named president of BC Electric, the predecessor to BC Hydro. He lived in the home with his wife, Mary Jane, until the mid-sixties when they both died (W.G. in 1964 and Mary Jane in 1966). While other expansive lots in the area were broken apart and developed into smaller properties, 2106 SW Marine stayed intact. Between the Murrins and Mr. Bull, there was only one other owner, who made changes to the house but not the lot size. The second owners' changes were minimal, with one of the most noticeable being the installation of an oversized carport off the front of the house. Mr. Bull tore it down upon buying, as he felt it took away from the home's curb appeal. For the most part, the original character of the Tudor-style cottage was intact. "When I walked onto the site and went into the house, I was immediately drawn in by how warm it was," says Mr. Bull says. The home’s main-floor dining room. One of the most noticeable elements of the home are its many gables, which is why the property is called the Gables Estate. Inside, it has six bedrooms and eight bathrooms spread out over four floors. The main floor features a family room, kitchen and butler's pantry, mud room near the attached garage, dining room, den and living room. The second floor has four bedrooms – each with his and hers closets and an en suite bathroom – as well as a 2,400 square foot master suite with a 1,000 square foot private terrace. The top floor's 1,167 square feet is a dedicated loft space with balcony and bathroom. The lower level has seven-foot ceilings and includes a gym, a 300-bottle wine cellar and tasting room and a theatre room with 100-inch projection TV and sound system. The renovation involved incorporating an in-floor heating system without damaging the original hardwood. After Mr. Bull bought the Gables Estate in 2014, he decided to renovate the 85-year-old home. "Originally, we thought we'd be a little bit more modest than we were," he says. "But then we realized it was an opportunity of a lifetime and decided we had to do it properly." Some parts of the house were given very modern looks in the renovation. In his professional life, Mr. Bull deals with commercial development – taking office building and shopping centres and renovating, expanding or updating them. So he knew right away how he wanted to approach the Gables, focusing on modernizing the kitchen, bathrooms and the mechanical systems of the home. "The tricky part was: How do we keep the old charm of the house but modernize it so it met contemporary standards?" Mr. Bull says. "It was a very intricate, time-consuming, detail-oriented process." One such challenge was getting an in-floor heating system to the main level without ruining the original hardwood. Builder Joe Marino and his team had to tackle it from below, accessing under the floor from the basement's ceiling. Much of the original wood detailing was maintained, including in the cigar room. While Mr. Bull wanted modern amenities in the house, he didn't want to lose its original feel so he keep as much of the warm wood detailing that initially attracted him as he could, such as in the "cigar room" (den) and the main foyer. 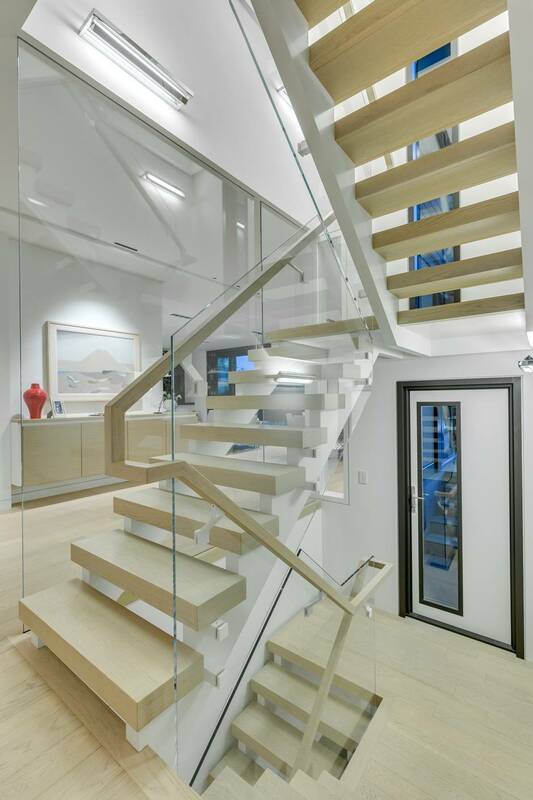 In contrast, some other areas of the home are very modern-looking, including the renovated family room with its 9 1/2-foot eclipse sliding doors and a secondary staircase with floating steps and glass partition. The family room kept many of its original features, but the old, beige paisley print wallpaper was removed and the room painted white. "This house – you can't replace the look or the feel of it," says Greg Carros, one of the property's listing agents. "Peter kept the integrity of the house throughout and just put modern features in." The grounds of the property were also substantially transformed during Mr. Bull's ownership, with the help of landscape architect Paul Sangha and his team. "It's really an oasis in the city," Mr. Bull says. The two-tiered backyard features a 65-foot-long infinity pool and a small golf course. "The landscaping is incredible," Mr. Carros says. "It's probably one finest of Vancouver." Each of the bedrooms features an ensuite bathroom. Since the renovation, the home has won many awards, including Canadian Homebuilder's Association national award for a whole house renovation over $1-million. The quality of the transformation is one of the many factors that went into figuring out the price, Mr. Carros says. "It's a little bit difficult to price the house," Mr. Bull says. "But our feeling between the two of us is that this is a fair price." Other factors in the pricing equation included the lot size (which is the largest residential property in Vancouver), the heritage of the home, all of the outdoor features and the neighbourhood. The lot is the largest residential property in Vancouver. "The beauty of this house is that we're about 10 minutes away from the airport, another 15 minutes to the downtown core," Mr. Carros says. Previously, the house was listed at $10,980,000 in 2014, when Mr. Bull bought the property. After his renovation, the Gables Estate went back on the market and is now listed at $29.8-million. Ultimately for Mr. Carros, pricing this property came down to math: "If you started from scratch, you couldn't replicate this house for this price." The modern family room opens to the pool area. With so many amenities, features and details, it's hard for Mr. Bull to pick a single favourite spot in the home. Some of his favourites, though, include the wood-panelled "cigar room" on the main level and the modern family room that seamlessly leads out to the pool. But one of the most impressive spots outside of the house is the 50-foot viewing deck. Thirty feet of it is suspended out over the 60-foot drop to the lower tier of the property. It's a place where you can look out over the tall fir trees and catch glimpses of the private golf course down below through the lush foliage. The 50-foot viewing deck extends over the lower tier of the property. When Mr. Bull stands there and looks out, he feels gratitude. "It's a privilege to own this place," he says. "It's an extravagant privilege."